We are at a confluence of two rivers, the rushing Wenatchee and the mighty Columbia in a land enveloped by the foothills and towering peaks of the Cascades. We are a place where the earth’s geology is ever present. We have harnessed the power of our waters to power the west and cultivated our valley to give the world fruits from our orchards and wine from our vineyards. The spirit of our people is the result of a place that knows how to produce. We put faith in the land to make the harvest each year and have innovated ways to share our bounty across this nation and world. Our innovation does not stop with the land; we invest in our children and believe that education is the key to our future success. We live a life of abundant choices. Underneath sunny skies we take to the slopes, the rivers, the trails, and the loop to ski, kayak, hike, and bike. Our streets and trails are filled with sculpture bringing art to our people. We are a small town to some and big city to others. But to all, whether visitor or local, we provide a way to escape from everyday routines. We are a place where a choice made history on the first transpacific flight. We are a place where a community chose to rally behind a vision to build a dam that would free the west. We have made a choice to embrace the future through our past in a building twice scrapped that will emerge as a market that will bring us together. ; The choices here are as plentiful as the orchards are fruitful. We invite you to choose this place; to visit, to explore, or to stay. 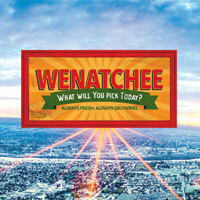 We are Wenatchee, Washington: What will you pick today?